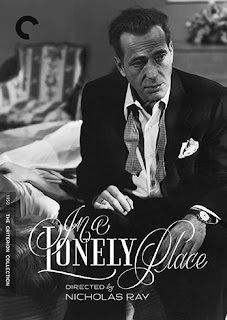 I’ve long been a fan of Humphrey Bogart, and “In A Lonely Place” is one of his more underrated films. With Criterion Collection’s recent release of the film on Blu-ray, I thought it was a good time to revisit this film. Bogart gave many great performances throughout his career, but his performance as Hollywood screenwriter Dixon Steele is one of his best. It was one of the rare opportunities for Bogart to play the character that loses in a fashion that leaves him utterly, emotionally broken. He made a career out of playing the bad guy, but became a beloved actor for his roles as the hero. Yet three of his most memorable performances were those of characters driven mad by anger and insecurity. They stood in stark contrast to the unflappable, charming heroes Hollywood had made him famous with. Perhaps the first was his turn as Fred C. Dobbs in 1948’s “Treasure of the Sierra Madre.” But it was his brilliant performance as Captain Queeg that nearly won him an Oscar in 1954 (it went to Marlon Brando for “On the Waterfront”). Yet his performance as Dixon Steele has continually been mentioned as one of his most personal performances. Many consider “In A Lonely Place” to be one of the best films about Hollywood ever made. It is without doubt the most tragically beautiful film about old Hollywood, and it remains relevant today. Bogart becomes the hard-boiled screenwriter furiously sticking to his belief in artistic freedom and creativity in a time and place full of sellout “popcorn salesmen.” The tragedy here is Dixon Steele is a man who, for all his attempts to remain the cynical, world weary artist, still believes in art, creativity and love. Yet we watch all of these things slowly slip away from him over the course of this film. Perhaps even learning a tough lesson about how success in love and art remains mutually exclusive. 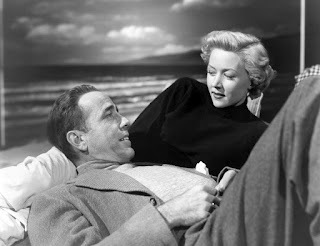 Both Bogart and his co-star Gloria Grahame add unique vulnerability to their roles as love turns to fear and suspicion of each other. That fear manifests itself in very different ways for each of them. Dixon fears Laurel will leave him or betray him. He credits her with inspiring some of his better work of late, but his violent temper might just be driving her away. Despite sharing a title and a few other elements with Dorothy B. Hughes’ novel of the same name, this film remains distinctly Nicholas Ray’s own creation. Both he and Bogart identified all too well with the idea of an artist working in an industry whose primary interest was the profitable business of cranking out films on a conveyor belt and shipping them out as fast as they could be made. Ray’s marriage to actress Gloria Grahame was failing as the production of this film wore on, which served as another obvious piece of inspiration. Even the production design of the apartments were modeled after the real Villa Primavera in West Hollywood where Ray lived after initially arriving in Los Angeles. And Bogart himself produced the film using his production company Santana Productions. It gave them the opportunity to make the film as they saw fit. And Bogart gave a performance many still identify as the one most like the real life Bogart. He was a man known off the screen for his drunken barroom brawls. The honesty of his performance adds another layer to a film designed to be an honest, even risky, commentary on the state of Hollywood. And then of course there’s Dixon’s refusal to stick strictly to the book he’s been hired to adapt. In much the same way, despite screenwriting credits for Edmund H. North and Andrew Solt, Ray himself made many changes to the script throughout the shooting of this film. The story begins with Dixon Steele meeting comical, naive hatcheck girl Mildred Atkinson (Martha Stewart) and taking her back to his apartment to continue their conversation about his latest screen adaptation. Yet shortly after she leaves his apartment we discover she’s been murdered and the police, who know of Dixon’s famous temper, peg him as a likely suspect. They bring him in for questioning at the police station in what is one of the film’s great early scenes. It’s a chance for Dixon to match wits with the detective in charge of the case. Bogart oozes his trademark unflappable confidence. It’s one of the few scenes for him to do so in this film, and allows us to see the stark contrast from where this character begins to where he ends up. More importantly this is where Dixon gets to meet his attractive neighbor Laurel Gray (Gloria Grahame), when he may have otherwise not had a reason to. As Dixon is falling quickly for Laurel, he retains his cold detachment for the lost life he was brought in to discuss. It’s a point that may seem to indict him in the case if he weren’t able to explain it away with his usual wit. As a screenwriter he’s accustomed to killing off characters, especially when it serves as a plot point with which to turn the main character’s fortunes. In this case, he accepts that someone had to die in order for him to meet the woman of his dreams. Yet in a bit of tragic irony, the murder investigation -that serves as this film noir’s MacGuffin- the very thing that brought them together in the first place, ends up haunting Dixon and Laurel throughout the rest of the film. The relationship they build together is quite like many of the great Hollywood romances of the period. It’s witty and provocative. Dixon uses his charm to disarm her, and it’s clear they’re both attracted to each other. There’s a loving beach scene, and numerous scenes in which we get to witness the small moments that make up their home life. Though these moments frequently turns from lighter moments to more uncertain ones. It’s hard to deny there is a romanticized idea of an artistic genius who’s also something of a charming nutcase. Many artists have unusual appearances or oddities about them. In some cases, the more odd they are the more talented they are. Here Dixon’s character quirk is a wild temper. Bogart plays Dixon like a balloon being stretched to the breaking point. At any moment he can go from a calm demeanor to seething with anger. Bogart’s face contorts, his eyes sharpen, his entire body goes rigid. The more Laurel witnesses Dixon’s outbursts of anger, especially when they start to be directed at her or their close friends, the more apparent her need of escape is. Yet after blowing off some steam Dixon settles down back into his calm, cool demeanor, often becoming very apologetic. It’s a transformation his long-suffering agent Mel (Art Smith) has witnessed countless times. It’s through the side characters that the world of Hollywood and Dixon’s attitude towards it all is established. Most of the people are met at the bars in which Dixon starts throwing punches. We hear characters poke fun at the fact that Dixon hasn’t written a hit since before the war, and there’s the young twerp of a filmmaker ranting about his own recent success. In all of these interactions we can see Dixon’s face bristling, and we know it’s a matter of time until he explodes. Through these scenes we understand how he came to such a cynical and world weary disposition. And more importantly it establishes how at odds his desire for freedom of artistic expression is with the rest of Hollywood at the time. Very often attention is drawn to the craft of screenwriting within the film. Dixon explains several things about screenwriting, and often draws comparisons between screenwriting and reality. It’s as if he wishes he could be writing his own story as he lives it. Yet the inability to control the story of his life is a direct cause for his quick temper. He fears losing Laurel, or not having his work bought or appreciated, and he grows suspicious of those around him. His drive for artistic freedom is a lonely one, and everyone around him seems to be trying to snuff it out. Yet that is only one way in which the title is a fitting one. There’s also the lonely place where the film begins without love. Then there’s the lonely place where these two characters exist later in the film as they separately struggle with their inner demons unable to confide in one another. It’s a line repeated several times, as if practicing for their inevitable end. One of the ways “In A Lonely Place” sets itself apart is in the way it shifts perspectives. While the first half of the film is told from Dixon’s perspective, which allows us to empathize with him, the latter half of the film sees things from Laurel’s perspective. This shift allows us to see things from both angles, which invests us properly in their relationship. It allows for the emotional gut punches later in the film to hit with the impact they might otherwise not have. As their fear and insecurities increase, they begin to mistrust each other. She lies to him and he knows it, but it’s because she doesn’t feel safe with him. As we know, once trust is gone, it’s gone. Ray improvised a new ending after shooting one he didn’t like that was more akin to the original book. This improvised scene is the perfect ending to this tale. Perhaps Imogen Sara Smith (author of “In Lonely Places: Film Noir Beyond the City”) said it best when she described it as “devastatingly perfect, perfectly devastating.” It’s a rare film noir that ends on a truly tragic note. 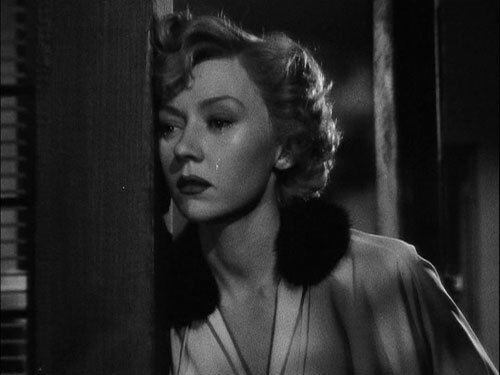 Death, defeat, failure, disappointment is commonplace, but rarely does film noir break your heart with lost love. Here it’s done in such a brilliant, tragic, but realistic way. While this noir breaks genre conventions by lacking hard-boiled detectives or gangsters or a true murder mystery, the fact fits perfectly within a film dedicated to breaking the mold. Yet somehow or another it ends up being one of the best examples of the genre.